Stop being afraid of someone entering your hotel or dorm room with this door stop. Simply slide it under your door and when it not only stops the door from being opened, it will also trigger a loud 120dB alarm sound. Do you ever worry about your safety when staying overnight in a hotel, or worry about the security of a loved one in a dorm room? The GE Smarthome 50246 is a terrific product that will provide peace of mind and security for you or a loved on knowing NON ONE can get past this door stop with a loud alarm. Do you have loved ones away at school? This is the perfect sercurity related gift. In seconds, they simply insert this door stop under the door. If anyone tries to push the door open, a loud alarm will sound! 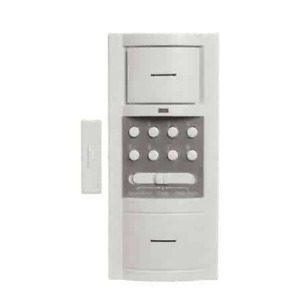 This is a very inexpensive product that will provide a tremendous amount of security. When traveling, simply put this small door stop in your bag. Once you get to your hotel room, simple put this door stop under the door. When the stopper detects pressure it activated an ear-peircing alarm to notify you that someone is trying to open the door. Of course the door stop does not allow the door to open AND you get the instant notification of the pressure detected by someone trying to open it. Presure activated product. When someone tries to open the door, the pressure applied on this product triggers the alarm. Alarm sounds at 120 decibel when pressure is applied. Also works as a door jam to prevent door from opening. Alarm deactivates when pressure is released from door stop plate. On/Off switch activates and deactivates alarm. Exactly what i was looking for. Only issue was with our slippery floor which was easily solved with a small silicon sticker. And shipping was on time and perfect.